Looking for a quick and easy low carb ice cream treat? 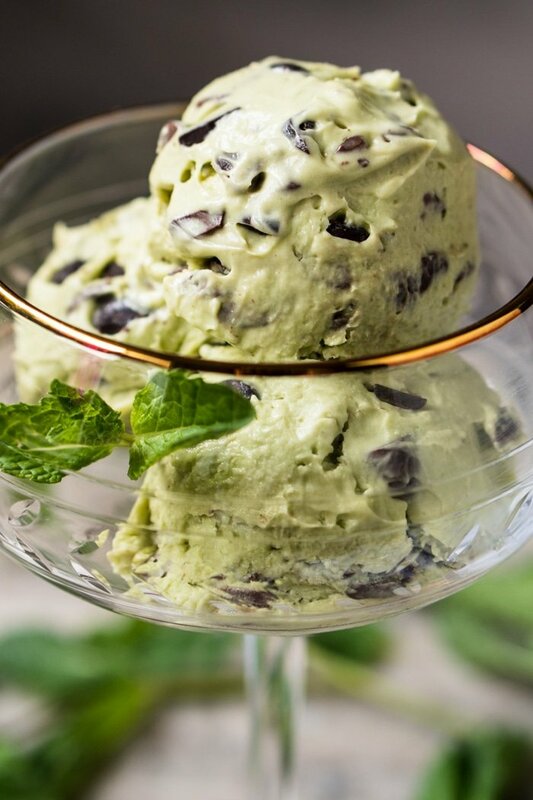 Creamy, fresh and luscious, look no further than this no-churn paleo and keto mint chocolate chip ice cream-for-1! This is a good one guys! A very good one. 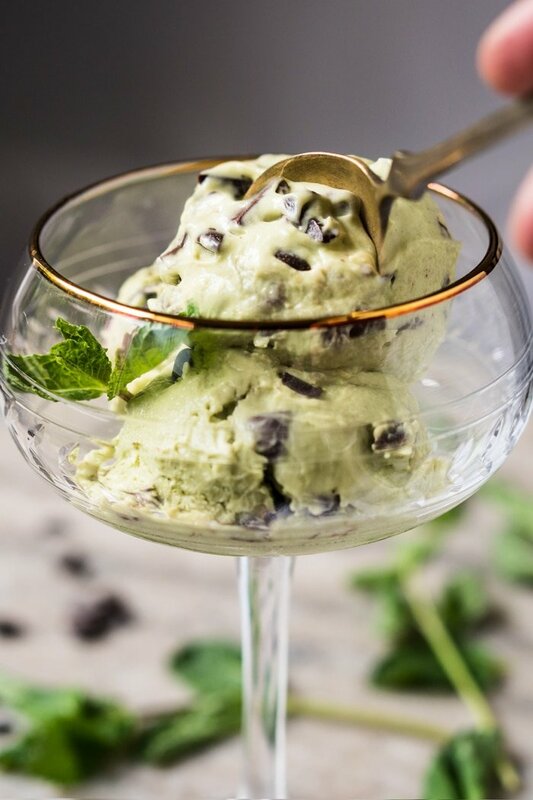 Inspired by the deliciousness and ease of our Shamrock shake, this sugar-free mint chocolate chip ice cream is an instant hit. Expect creamy, luscious and super tasty results! You could definitely call this one a ‘nice-cream’ btw, as it’s loaded with healthy fats and plenty of nutrients (in the form of a sneaky avocado!). No worries, you can’t taste it! It’s also ideal for a quick ice cream (and single-serving!) craving. You simply blend all the ingredients together until creamy smooth and pop in the freezer for an hour or two. If you use fat bomb moulds, you’ll be in ice cream territory within the hour. And yes, you can always double (tripe or quadruple) the recipe and keep it handy for a sunny day. In terms of the mint flavor in this guy, while you can use fresh mint leaves but I honestly wouldn’t recommend it. You see, you would have to infuse the coconut milk (or heavy cream) with the mint leaves for roughly 30 mins and let it cool. And since this recipe is all about quick, easy and great results, peppermint extract is the way to go. Plus, it’ll give your ‘nice-cream’ that strong minty flavor of store-bought varieties. And please try and skip any form of artificial colorings. Yellow no. 5 (part of the green dye) is a serious allergen that has been tied to hyperactivity in children (amongst other stuff). So go ahead and get the green hue the natural route. i.e. an avocado, which adds crazy creaminess, healthy fats and plenty of nutrients. 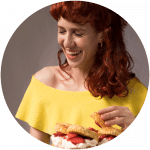 Xylitol and allulose are, without a doubt, the best sweeteners for keto ice cream. 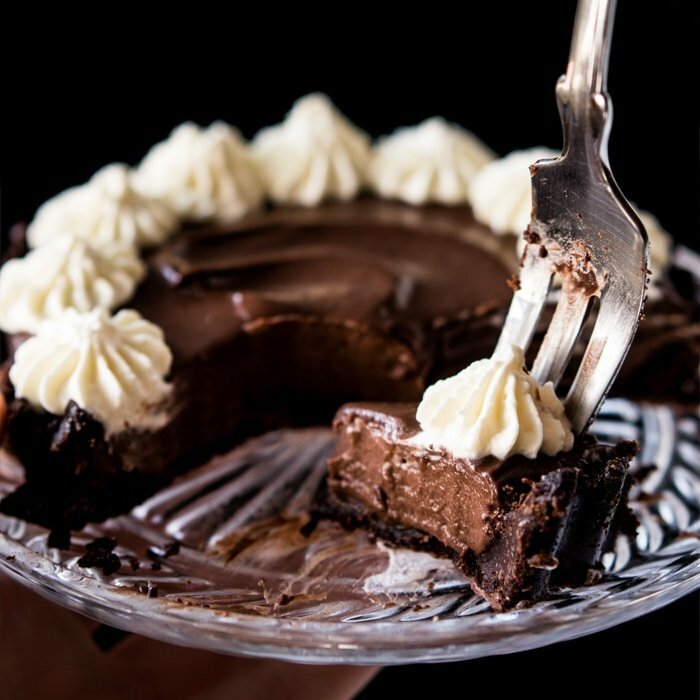 They help to retain the creamy texture (they work pretty much like inverted sugars! ), and allow you to skip the churning if need be in many recipes. And if using allulose, just keep in mind that it’s about 70% the sweetness of sugar and xylitol (i.e. you’ll have to add 30% more). Having said that, you can get away with using erythritol with good results too. Just note that you’ll need to thaw out your ice cream on the counter for 15-20 mins so its scoopable! If paleo, or not restricted by sugars, coconut sugar would work great too (just expect a light caramel hue). Keep in mind that for best texture and easiest blending, you may want to use a powdered sweetener. This is particularly important if using erythritol, as it’s a bit harder to dissolve. So get your blender out, make sure it’s completely dry, and process your sweetener of choice until powdered. Just make sure you wait a few moments for the dust to settle before opening the blender or food processor. Looking for a quick and easy low carb ice cream treat? 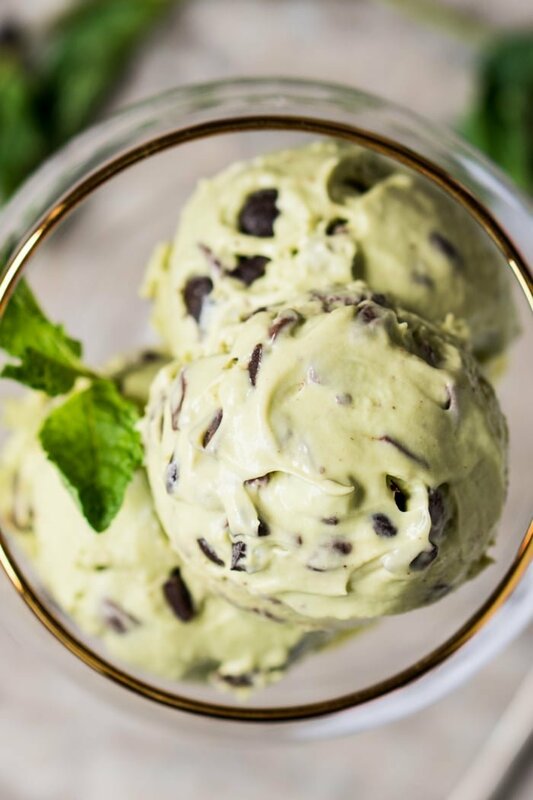 Creamy, fresh and luscious, look no further than this paleo and keto mint chocolate chip ice cream-for-1! If your coconut milk has the solids and liquids separated, pop it in a quick water bath until everything just comes together. Be sure it's back at room temp before blending. 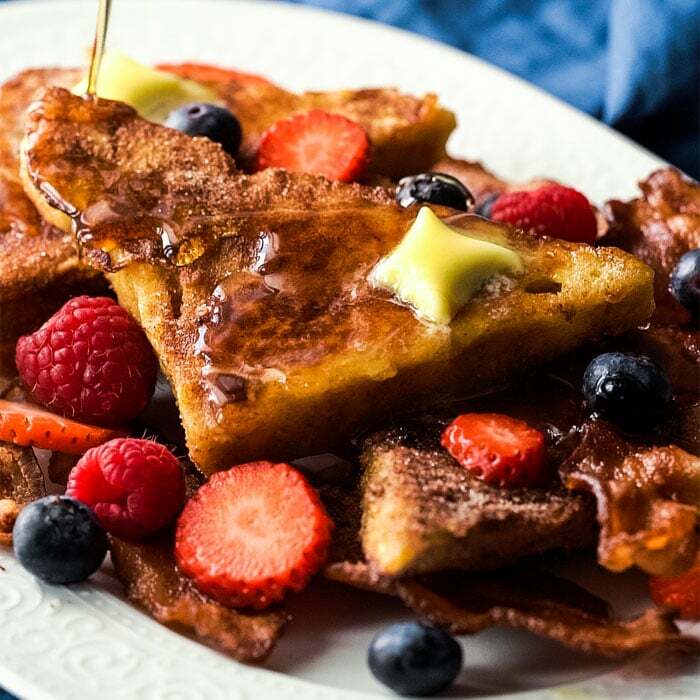 Add coconut milk, avocado, vanilla extract, peppermint extract, lemon juice, salt and sweetener to a blender (immersion blenders work amazing here!) and blend until creamy smooth. Adjust sweetness and minty-ness to taste. Place in a sealable container (or fat bomb moulds!) and freeze until set, about 2 hours (less for the mini bombs). 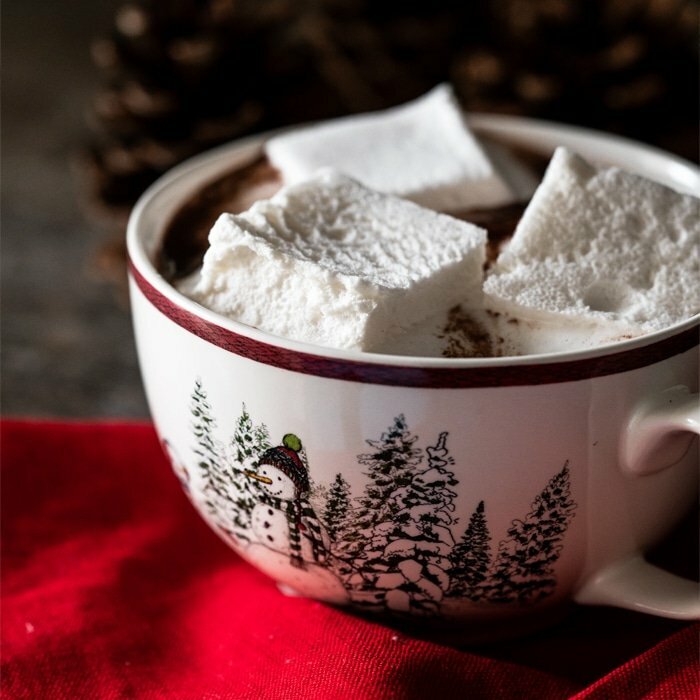 If freezing overnight, leave out at room temp for 10-20 mins before indulging. *In terms of coconut milk brands, I’ve recently discovered Roland’s Organic Milk and I’m in love. It’s sooo creamy even right of the can, and has a much milder flavor than any other brand I’ve tried. Honestly cannot recommend it enough (can you tell I’m obsessed?!). Plus, it whips beautifully. **See section on sweeteners for deets and possible subs. Please note that nutrition facts were estimated using 50g of avocado (about half a medium one) and without the chocolate chips (as nutrition values vary widely). But for e.g., if you use half a bar of Lily's dark chocolate, add roughly 2g net carbs per scoop. Do u need to whip the coconut milk first before blending or only heavy cream if using that instead?? It’s taste just like the real thing! The only problem is that is froze so hard. So, I stirred in 1/2 tsp of vodka (which has zero carbs). It keeps it a bit softer, more like regular ice cream. Now it doesn’t freeze so hard and I can have a bite on the run without having to wait for it to thaw!! Hi Sam! I doubt it as you’ll be affecting the taste and texture of the whole ice cream… xo! Hi Paola, do you think inulin will be ok in this? 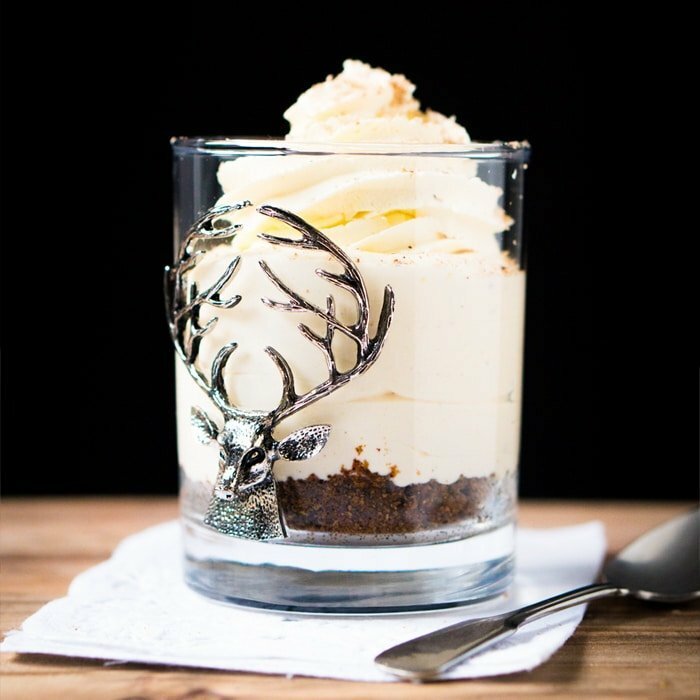 Are there different instructions for the whipped cream version? Will this develop icicles? Should we add alcohol? Hi Paola, I have made the chocolate, the mint chocolate chip, and the vanilla icecream…soooo yummy. I added some lavender to the vanilla and the combination was great. A subtle hint of lavender was just right. Just having to get the icecream to the right constituency for rolling and serving..Idid put 6tsp of vanilla in but it still froze real hard. Having a heat wave here in Uk so doesn’t take to long to soften it. I read that adding alcohol will put you out of Ketosis, so not worth it to keep the icecream softer. Any other bright ideas? Hi Ethne! Have you tried xylitol? It works like an inverted sugar (melted into the milk) and keeps the ice cream scoopable for weeks! Otherwise regarding the booze (obviously I’m no doctor and this isn’t my area of expertise), but I’ve read plenty that alcohol doesn’t kick you out of ketosis, rather it take some peeps deeper. I don’t drink though, I only use it for cooking purposes and I haven’t noticed any difference in my ketone readings. Xo! Question: Do you measure the coconut cream/heavy cream before or after it is whipped? 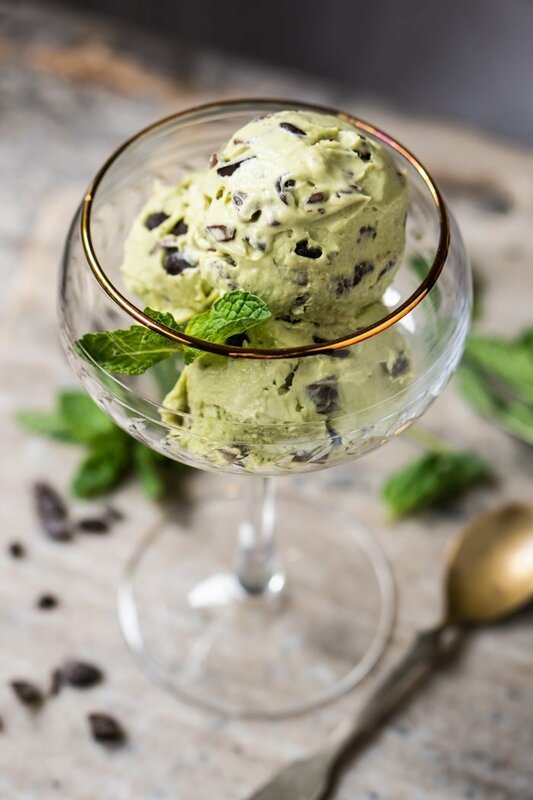 This week I made the mint chocolate chip ice cream….so delicious…and also the chocolate ice cream, absolute winners and so easy to make. By popular demand have just made mint ice cream again for work colleagues! Great to find a nice recipe without an ice cream maker. Hi Ethne! I have another comment from you on the vanilla froyo, maybe that’s why? Thanks for the heads up though! Ahh not me, see later comment..never been here before…but I like what I see!! Thanks. This was really good I was worried about the avocado, so I still only used half an avocado even though I doubled the recipe. I didn’t notice it in there at all though, so I might try adding a little more next time. 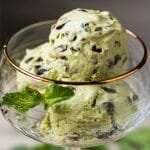 I also used I think 3 drops of Young Living peppermint essential oil instead of peppermint extract, and I made it in my ice cream maker. I’ll definitely be making this again! I can’t even believe how good this is! 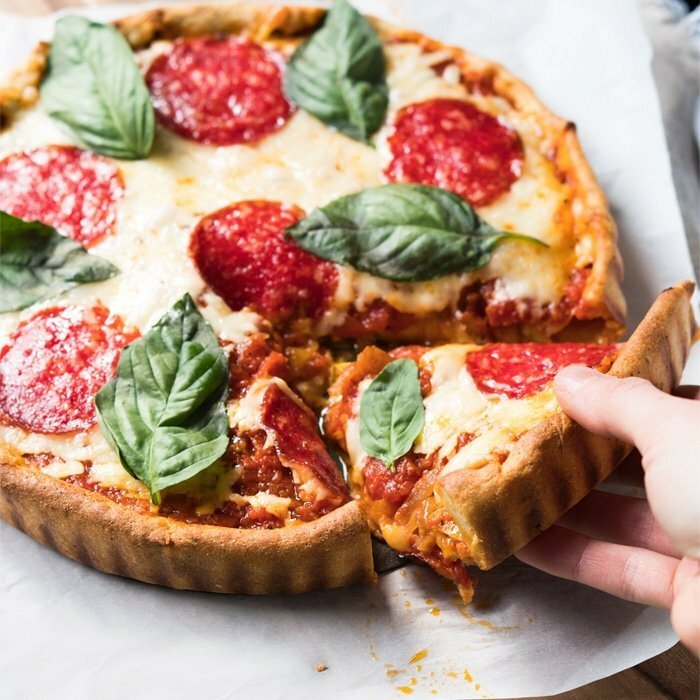 This is the first recipe I’ve made from this website, and I’m always so leery of what recipes can be like from paleo websites, so I’m careful what I spend my time, energy and money on when it comes to recipes. But Oh My Gosh, this stuff is amazing. 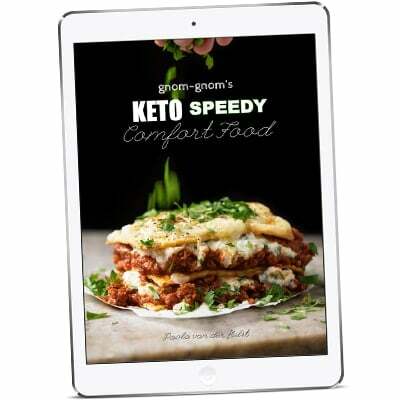 I am going to try many more recipes from gnom gnom! I quadrupled this because I had 2 avocados and I’m so GLAD I did that. I have dessert for the next six nights ! I’m just tried some and it’s not quite frozen yet but my mouth is totally watering for more! Thank you! Hi there, this sounds great, and I can’t wait to try it. Just a question tho about when to add the chocolate chips… didn’t see that in the directions and am thinking it would be stirred in by hand after using the immersion blender, and before putting into the freezer. Can you confirm? Thanks! Hi Mindy! I’m not sure as I’ve never tried that product. But I have tried the vanilla ones, and I’m not sure you’ll get enough minty-ness coming through? Can you clarify something for me? I see you reccomend powdered sweetner, and xylitol as #1. When I click on the affiliate, xylitol, link in the recipe, it explains that that particular one is more granular…??? Check out the section on sweeteners, you can just regrind it into powder in your blender 😉 xo! OMG! I just made this. I made 4 times the amount because I had a pint of cream that was nearing expiration. I used only 5 tablespoons of swerve (since I don’t like it too sweet) and added Lily’s Chocolate Chips. This stuff is the bomb! I just put it in the freezer but had to lick the immersion blender and the bowl. I can’t wait to try it frozen. I am so happy right now. Ice cream has been one of the things I miss, and I think Halo tastes like crap. This changes everything! THANK YOU! LOL Terri that’s awesome to hear! So happy it was bowl-lickingly good ;)! xo! Made this just now in my ice cream maker(so I didn’t have to wait 2 hrs) love it and its kid and husband approved as well. Made 4x the recipe and used a half a bar of lily’s it’s very very creamy and just chocolate chip-py enough for me. The only thing I forgot to do was add the lemon juice but it’s great! Hi there….just a quick question…..are we supposed to whip the cream and.or coconut milk before blending it with the other ingredients? Hi Patty! I would just whip the heavy cream. 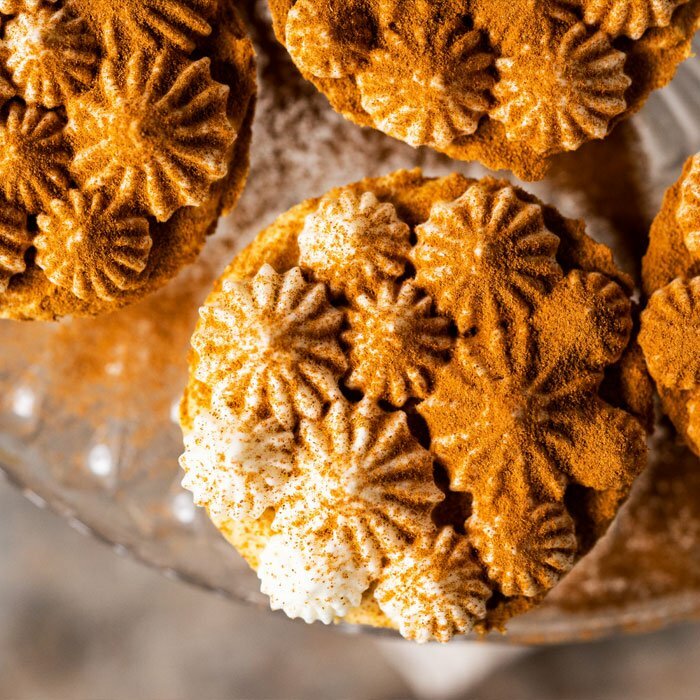 I didn’t notice any difference when made with coconut xo!